Charles Porter Kimball, born in 1825, followed in his father’s footsteps to become a carriage builder. When he was twenty two, he struck out on his own, establishing a carriage business in Norway. From this modest beginning, Kimball rose to become a world-renowned carriage manufacturer. Kimball’s father, Peter Kimball, had descended through six generations of wheelwrights and had become a wheelwright himself, settling in Hamlin’s Gore, Oxford County, Maine. “The Gore,” as it was sometimes known, was a wedge of land situated between Bethel and Woodstock. It would eventually become annexed to the latter town. Initially, Peter Kimball produced only cart wheels, since the roads of early Oxford County were hardly suitable for any finer livery than ox-carts. But he eventually built a shop and began making not only wheels, but carriages and sleighs as well. These soon gained a reputation for economy and sturdiness throughout the area. As each of Peter’s sons took up their apprenticeship in their father’s shop, they must have learned not only the technicalities of this trade, but they must also have come to understand the management of the business, the skills of commercial competition, and how to satisfy the needs of the consumer, since all six of the boys went on to successful manufacturing careers. Indeed, two of them eventually enjoyed reputations among the most important manufacturers in America; and one of these, Charles Porter Kimball, gained international recognition, as well. At the age of eighteen, he had moved from the Gore to Bridgton to work with his older brother, James; but four years later, borrowing a thousand dollars from a physician in Bridgton, Kimball came to Norway to open his own shop. His business was good. At first he hired two additional hands, then four, then fifteen. By the spring of 1850, just three years after arriving in town, he purchased a larger site next to the stream behind the present-day opera house, built a three-story manufactory, and soon employed more than thirty workers. The federal census which was conducted that year records him as the twenty-four year old head of a “household” which included four blacksmiths, five wood mechanics, a carpenter, and two painters. By 1852, Kimball had established a retail outlet in Portland to sell the carriages he was building in Norway, but business in the city became so brisk that in 1854, he relocated his entire operation to that place, where it was enlarged and enlarged again. In Portland, Kimball’s business succeeded well enough to afford him the time and financial wherewithal to delve into various other pursuits. Like the majority of his Oxford County brethren, he had been a committed Democrat prior to the Civil War; but unlike so many of those same citizens, he did not join the new Republican party in the 1850s, but remained a Democrat “of the old school” throughout his life. He was elected Portland city alderman and served as chairman of the board; he was appointed surveyor of the port of Falmouth and Portland; and he was twice the candidate of the Democrats—and twice defeated—for the governorship. During these same years, he was, variously, several times president of the Maine Charitable Mechanics Association and also of the city Board of Manufacturers. However, in spite of his involvement in these many commercial, political, and benevolent pursuits, it appears that after almost two decades in Maine’s largest city, Kimball was becoming interested in ever more cosmopolitan endeavors. Or it might have been that with the death of his wife in 1870, he simply sought additional personal and professional activity to keep himself occupied. In any event, by the early 1870s, preparation was underway in virtually every industry and in every state for the grand centennial exposition to be held in Philadelphia in 1876; and in 1871, when Governor Sidney Perham—a fellow townsman of Woodstock—proposed that Kimball become a member of the state’s Centennial Commission, he accepted. The following year, when the most prominent carriage manufacturers from throughout the country met in New York to form the Carriage Builders National Association, Charles Porter Kimball was unanimously elected president of the new organization; and he held the presidency through several subsequent elections. 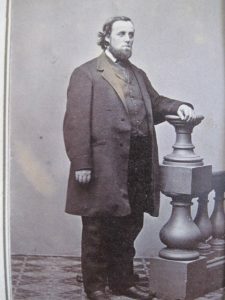 As a result of his involvement with the centennial and with the new national professional association, Kimball became acquainted with John W. Brewster, who had been one of the moving forces behind the formation of the association and who was one of the most successful carriage manufacturers of New York City. In the year 1875, apparently enjoying his work outside of Maine, Kimball made three significant changes. Relocating from Portland to New York City, he formed a partnership with John Brewster and began producing a line of sleighs known as the “Kimball-Brewster,” which was later displayed at the Centennial Exposition. He resigned his position on Maine’s Centennial Commission and immediately accepted Governor Samuel Tilden’s appointment to New York’s board. Finally, and most importantly, he became married to Hannah (Getchell) Sparhawk, the daughter of a prosperous Chicago merchant, Henry F. Getchell. Almost immediately Charles moved to the burgeoning Midwestern metropolis and contracted for the building of a huge carriage manufactory there. As might have been expected, he soon became a dominant producer in the market. 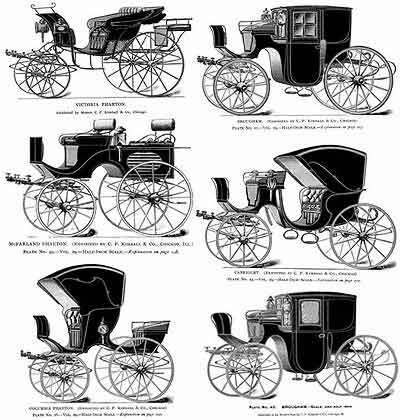 Over the next thirty years, C. Kimball & Company—first under the leadership of its founder, and then under that of his son, Charles Frederick Kimball—became not only one of the largest carriage manufacturers in North America, but in the world. The company was known not only for the volume of its production but also for the distinctiveness and quality of its vehicles—especially of its more expensive models. When notables visited the city, they were toured about in Kimball carriages; and when America was called upon to display its finest craftsmanship at the Paris Exposition of 1889, C. Kimball & Company obliged with a model of its “Portland Cutter” sleigh, a design by which the company had been known since its very earliest years. When Kimball died in Chicago in 1891, his body was returned to Portland to its final resting place in Evergreen Cemetery. Many thanks to Larry Glatz for the use of this article.